I generally despise calling something a "must-see movie" because the media and movie studios overuse the phrase and apply it to blockbuster action movies that no one really must see. However, sometimes a film comes along that everyone should see. Burn: One Year on the Frontlines of the Battle to Save Detroit is such a film. The documentary follows the lives of the firefighters of Engine Company 50 on Detroit's East Side. The movie opens with firefighters huddled together outside the door of a burning brick house. 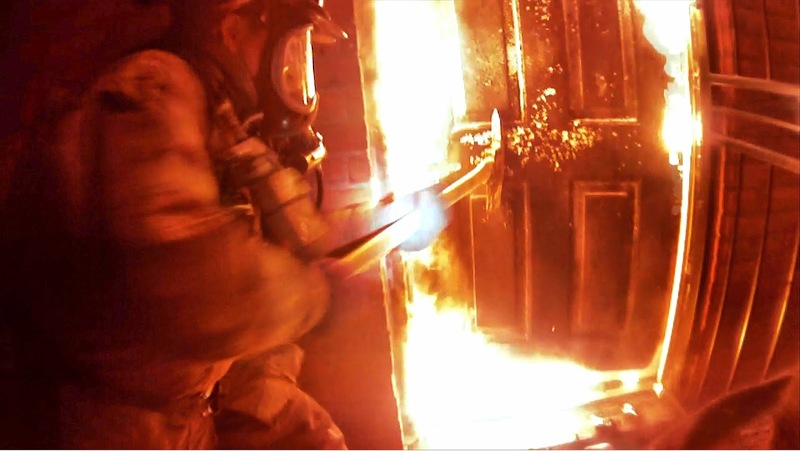 Flames outline the door until one of the men pushes the door in with his axe, causing a fireball to explode outward from the home. As the camera focuses on the inferno inside the house, the company's Field Engine Operator Dave Parnell's voice utters, "I wish my head could forget what my eyes have seen in thirty-two years of firefighting." After watching this film, the audience will not forget what their eyes have seen. 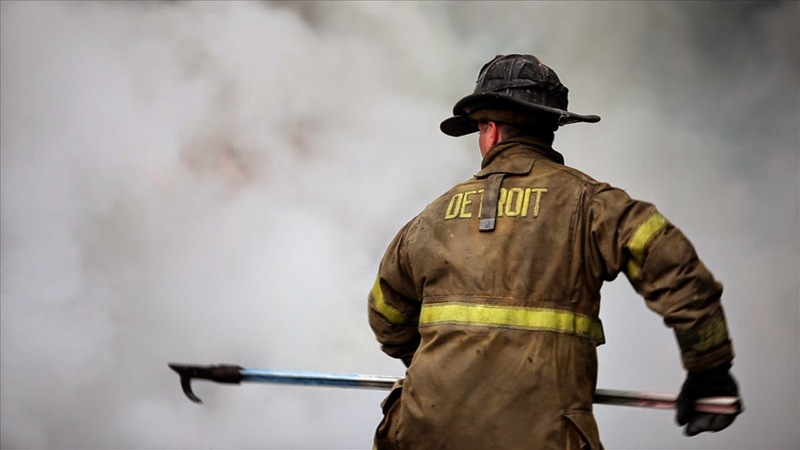 For the next hour and twenty minutes, filmmakers Tom Putnam and Brenna Sanchez give their viewers an awe-inspiring perspective of the lives and struggles of Detroit firefighters. The action includes footage of firefighters entering the depths of houses with fire raging all around them and no idea what dangers lie ahead. The firefighters of Company 50 explain that Detroit firefighters fight the fire from the inside and that observers would be more likely to see them shooting water out of a house instead of the usual image of firefighters shooting water in. The documentary highlights horrific statistics about Detroit, including the 80,000 vacant homes, the sad reality that most of the fires are caused by arson (95% according to one of firefighters in the film), and the department having half as many firefighters as it did in 1954 to deal with a 300% increase in fires per capita. Despite these statistics, equipment that does not work, trucks that break down, a fire alarm system that malfunctions, incredibly low pay, and threats of losing their pensions, the group of men continue to risk their lives for the safety of others. Perhaps the need to fight fire is in their blood, as many followed fathers, grandfathers, and uncles into the profession. Newly hired fire commissioner Donald Austin appears and immediately upsets his charges by challenging them to be more responsible with equipment that is totally insufficient in the first place. To Austin's credit, he did not shy away from appearing in the documentary, and although he resigned after the film was released, he does come off in a sympathetic light for taking a job with a city that wanted him to cut costs when there was nothing left to cut. The film primarily focuses on Parnell and his soon-to-be retirement and firefighter Brendan Milewski, who was paralyzed when a building collapsed on him during a call. Parnell struggles with the realization that everything he planned for his retirement will not happen due to a tragedy that strikes his family. Milewski attacks his physical therapy in an attempt to regain some semblance of an independent life after living his entire life as a free spirit. Despite the somber nature of the film, the filmmakers remind us that Detroit and its firefighters are not without hope. The bravery of the men of Company 50 shines through as they continue to suit up and fight fires despite the thanklessness of the job. Milewski's physical therapy sessions are heartbreaking, yet they are also uplifting as he progresses. Near the end of the film, Detroit's beautiful downtown shines, and bulldozers tear down vacant houses, and with them potentially deadly fires. The Engine Company 50 firefighters' optimism in the face of such despair is the greatest beacon of hope that the film offers. In the end, the reality of the film is captivating. The brotherhood among the firefighters is true, and the danger they face is undeniable. It is easy to look at the truly wonderful things happening in Detroit these days and to forget about the hard truths still facing this city. Burn shines a light directly on the plight of the Detroit Fire Department and the neighborhoods damaged by arson. It is a study of true bravery and sacrifice that is more important for our society than the so-called superhero blockbusters released every summer. Detroit's real superheroes enter buildings engulfed in flames that the rest of us run out of while making a starting salary of $30,000 per year. As the movie closes, the under-equipped but unbroken men hurry out for another call, leaving the audience asking who is going to heed their call. And that is why Burn is a must-see movie. Burn is available for purchase here and here, and some of the proceeds will go to the Leary Firefighters Foundation to help purchase equipment for Detroit firefighters. The film is also available for free streaming on Hulu and on Netflix with a subscription. However, if you do stream, please consider a donation to the Detroit Firemen's Fund.